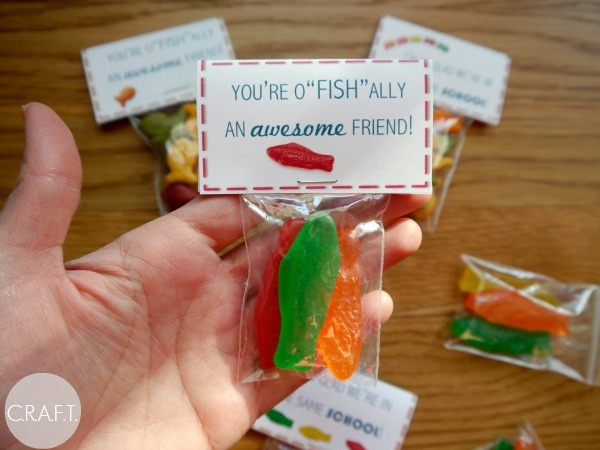 You're o-fish-ally an awesome friend! - C.R.A.F.T. You’re o-fish-ally an awesome friend! The Share the Love series is in full swing, but today we have an extra special cheesy treat! It’s one month until the big ol’ day of love and we’ve got 16 bloggers sharing free Valentine printables from all over blog land! (All of the links at the bottom of this post!) Oh and here’s a list of 100+ valentine day sayings and 63 non candy Valentines treats if you need even more cheesy Valentines puns. Today’s printable is perfect for boys or girls and even has a healthy option, woot woot! You can either use the printable with Sweedish Fish or Gold Fish! Yum. Print out your valentines, cut them out, and then fill your small plastic envelopes with the treats. 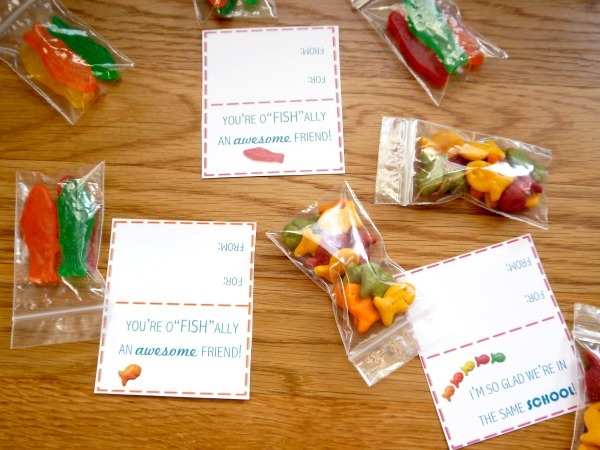 Each printable has the option for the Swedish fish and gold fish printable. Then fold the printable on the dotted line, fold over your tiny zip lock, and staple. Voila. Super easy. This just makes me smile because it’s so cute! Thanks for including me in this blog hop! So appreciated! 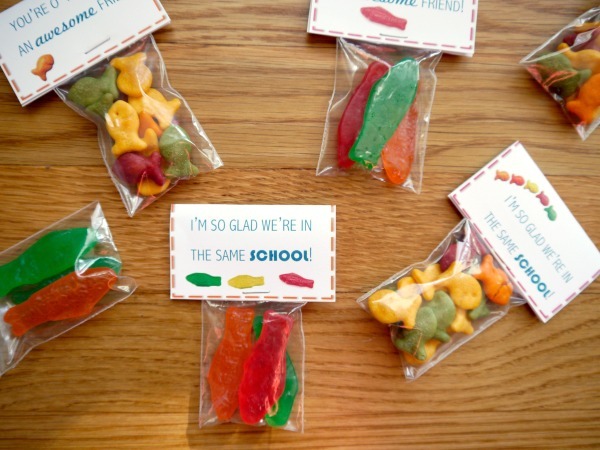 YAY for Goldfish and Gummy Fish… super cute idea, friend! Thanks so much for including me in the blog hop fun. Hugs. I love the healthy option! Thanks for the awesome hop! LOVE this collection of cute Valentines! I missed the Monday Funday link party this week, but I just posted 2 cute no-candy Valentines, hope you’ll check them out! wow these are so cute! I have a plastic bags that would work great for this. How fun! My oldest daughter loves Swedish fish candies and even though she is high school, I think her friends would enjoy the candies in the baggies. These are so cute! Pinned to my ‘Valentine’s’ board…now if I can just make time to actually DO some of them! What a wonderful idea! I just wish my kids were still young enough to give Valentine’s to their classes. I will have to share the idea with my grandsons instead. Thank you for linking up with the Oh My Heartsie Girls Wordless Wednesday Link Party! This is SO much better than candy and how creative! Love it! Thanks for sharing at OMHG WW this week! So cute! Thanks so much for sharing at the Create & Share Link Party. Hope to see you again tomorrow night (7:00 PM MST)! These are adorable! 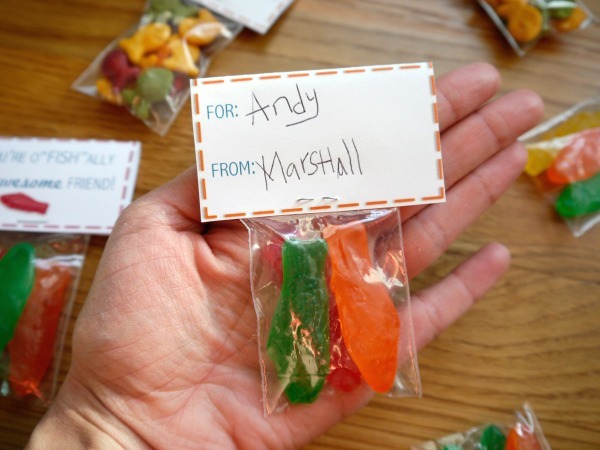 So creative and way better than the predictable drugstore cards with candy. Love this! Totally adorable idea! Thank you for sharing with us at Snickerdoodle Sunday! Pinned and tweeted. These are just adorable! 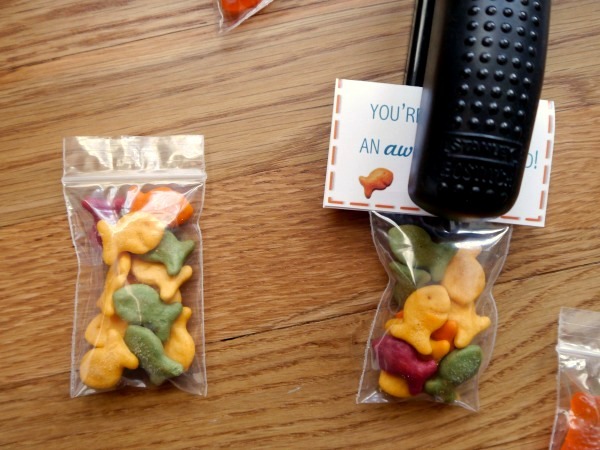 I love the ones with the goldfish such a great candy alternative! Super cute! I love the labels and the fish. Thanks for sharing at Funtastic Friday. Hi!! Where are the printable downloads? I don’t see them on my side.